A dry, dry blend of Cabernet Sauvignon, Petite Sirah, and Zinfandel. 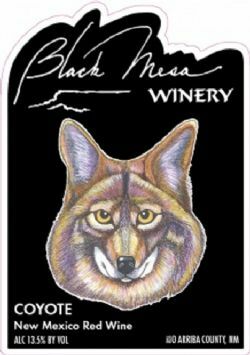 Black Mesa's signature wine. It is selected from our production of the best barrels of these wines, blended together, and then aged from 18-24 months primarily in French Oak. all the attention to detail yields a big "bruiser" of a wine with ripe plum, blackberry, coca, cassis, and nutmeg, with a lingering finish. An excellent choice to pair with a steak or buffalo entree. Drink it now or add it to your library to enjoy in the next 2-5 years.